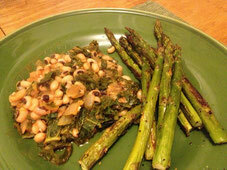 Some days, a simple dinner of beans and greens is all you need. We love Appetite for Reduction and I use it more than any other book in the kitchen. Seth, being a proper Southern boy, loves black-eyed peas. I’ve learned to love them since I started cooking them for him, and other than chickpeas, we probably cook those more often than any other bean. This is a staple recipe in our arsenal and comes up in the rotation pretty regularly. It’s really simple to make and just tastes so darn good. 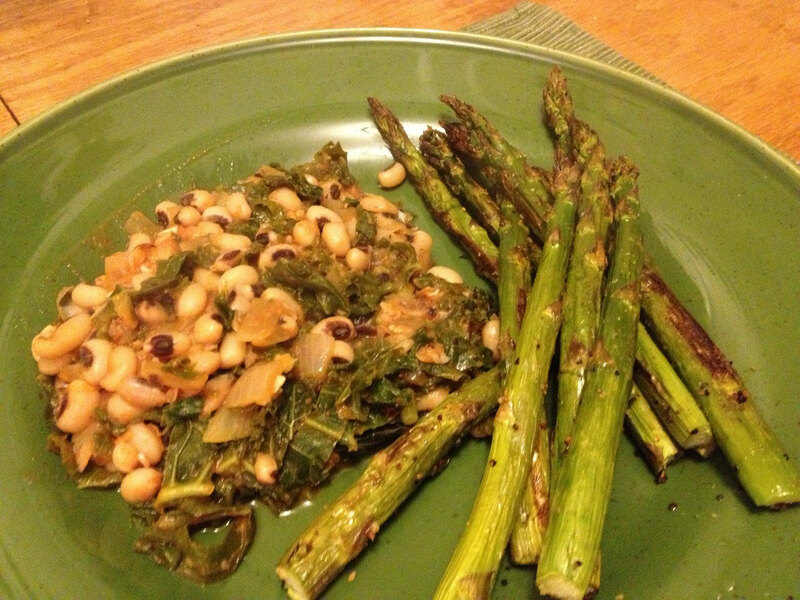 Beans, kale, onion and garlic. What’s not to love? We like to use Hotlanta Hot Sauce in it. Super good. Even though there’s a bunch of kale (or whatever greens you like) in the peas, we like to have a side of broccoli, or asparagus, or a salad with it. Tonight, asparagus won.